This article is about housing. For other uses, see Semi-detached (disambiguation). A semi-detached house (often abbreviated to semi) is a single family dwelling house built as one of a pair that share one common wall. Often, each house's layout is a mirror image of the other. Semi-detached houses are the most common property type in the UK. They account for 32% of UK housing transactions and 32% of the English housing stock as of 2008. Between 1945 and 1964, 41% of all properties built were semis, but after 1980 this fell to 15%. Housing for the farm labourer in 1815 was typically a one-room shed with an outshot for a scullery and pantry, and two bedrooms upstairs. The house would be of brick, stone if it occurred locally, or cob on a wooden frame. They were unsanitary, but the biggest problem was they were simply too few. Population was increasing, and after the enclosure acts, labourers could not find spare land to build their own homes, so it fell to the landowner or the speculative builder. Estate villages followed vernacular patterns, but this changed to adopting model designs from pattern books. By the turn of the 18th century, the landowners chose a "picturesque" style. They built double cottages as a means of reducing cost. Smith in 1834 wrote "this species of cottage can be built cheaper than two single ones, and, in general, these double cottages are found to be warmer and fully as comfortable as single ones". In Birmingham, Wolverhampton and the Potteries there was a tradition dating from the 1790s of artisans saving through mutuals and Friendly Societies. In the 1840s, the permanent building society model was adopted. The Woolwich Equitable was founded in 1847, the Leeds Permanent in 1848 and Bradford Equitable in 1851. Artisans could invest and then borrow a sum for a mortgage on their own property. In the wool towns of Yorkshire three families built villages for their workers. In each, there was an hierarchy of houses: houses in long terraces for the worker, larger houses in shorter terraces for the overlookers, semi-detached houses for the junior managers, and detached houses for the elite. The first village was built by Colonel Edward Ackroyd, at Copley, West Yorkshire between 1849–53, the second by Sir Titus Salt, between 1851 and 1861 at Saltaire, and the third was the West Hill Park Estate in Halifax built by John Crossley. The model villages in Lancashire came later, with developments like Houldsworth Village. Semi detached housing in colliery villages was rare; status here was determined by the length of the terrace. Built circa 1870 two semi-detached cottages at Mentmore, UK masquerade as one Mock Tudor style house. Semi-detached houses first began to be planned systematically in late 18th-century Georgian architecture, as a suburban compromise between the terraced houses of close to the city centre, and the detached "villas" further out, where land was cheaper. There had been occasional examples in town centres going back to medieval times. Most early examples are in what are now the outer fringes of Central London, but were then in areas being built up for the first time. Blackheath, Chalk Farm and St John's Wood are among the areas contesting being the original home of the semi. Sir John Summerson gave primacy to the Eyre Estate of St John's Wood. A plan for this exists dated 1794, where "the whole development consists of pairs of semi-detached houses, So far as I know, this is the first recorded scheme of the kind". The French Wars put an end to this scheme, but when the development was finally built it retained the semi-detached form, "a revolution of striking significance and far-reaching effect". 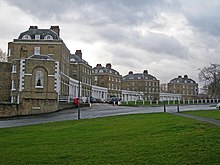 A particular style of semi seen from these early years is the row of houses where each pair is linked by a wall along the frontage, as at The Paragon in Blackheath, where a blank colonnade runs between the houses. Most early examples were relatively large houses with access at the rear, but from around the same time, rural cottages were sometimes built as "double cottages", mainly to save the expense of extra walls. During the 19th century, a father and son architectural partnership, John Shaw, Sr. and John Shaw, Jr., drew up designs for semi-detached housing in London. Examples of their work can be seen in Chalk Farm, North London. John Nash better known for his regency terraces built some semi-detached villas either side of the Regent's Canal, they were styled to appear as substantial single detached villas with the entrances to the side. Similarly John Claudius Loudon, the landscape gardener built a pair of semi-detached villas in Porchester Terrace in 1825, fashioned to appear as a single house. In his 1838 book, the Suburban Gardener and Villa Companion, he gives advice on how to disguise the join by using false windows. The Public Health Act 1875 described the structure and size minimum size of the terraced house and the grid iron street pattern that towns had to adopt. This restricted the viability of a placing a semi in a large garden. It stated that the building line should be 11m apart, and that there should be rear access to allow the removal of nightsoil. In 1875, it was thought that having a privy inside the house was unhealthy. Cold water came from a stand pipe in the yard, and lighting was by candle or by gas mantles. Heating and cooking was done by coal and hot water was boiled in kettles on the living room range. Kitchens were rare - the wet activities were done outside or in the scullery. Later, water was piped to the house, and some living room fires had a back boiler to heat it. During the First World War the Tudor Walters Report was published improving the standard of accommodation needed for Homes fit for heroes. The Housing, Town Planning, &c. Act 1919 (Addison Act) incorporated those recommendations including one that allowed for Radburn style estate layout. It was thus expected that small clusters of up to 15 houses would circle small cul-de-sacs of a district feeder road. This tipped the economic balance away from short terraces towards pairs of semi-detached houses. The housing density was generous, but this deteriorated in 1923 when the Conservatives gained control again. Local government was the provider of council houses, streets and small estates were designed and built by a local speculative builder when land was released. They were sold when complete to the resident. There had ceased to be a tradition of self-build. After the Second World War, there was a chronic shortage of houses. In the short term this was relieved by the construction of pre-fabs with a ten-year life. The successor was the pre-cast reinforced concrete semi-detached house. Though the frame was concrete the panels were often traditional brick, so the final building was indistinguishable from a traditionally built house. The recommendations of the Parker Morris Committee became mandatory for all public housing from 1967 till 1980. Initially the private sector adopted them too, but gradually built to a lower standard. This style of housing, although built throughout the world, is commonly seen as particularly symbolic of the suburbanisation of the United Kingdom and Ireland, or post-war homes in Central Canada. In New England, certain other parts of the United States, and most of Canada, this style is sometimes colloquially called a duplex. Elsewhere, however, "duplex" refers to a building split into two flats/apartments (one above the other). Semi-detached houses are typically referred to in the Mid-Atlantic region (particularly in Pennsylvania) as twins. 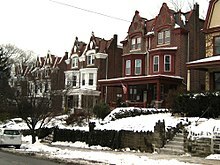 Semi-detached houses ("twins") in the Mount Airy section of Philadelphia, Pennsylvania, USA. Edwardian-era 'semis' in Dubbo, New South Wales. When new, the design of each side would have been identical. In Australia, a semi-detached house is a different form of real property title from a townhouse. A semi-detached home is generally held as a Torrens Titled property, whilst a townhouse is a Strata Titled unit. A semi-detached house sits on a single property, owned in its entirety by the owner of the semi-detached house; a townhouse has a strata title or more recently known as a community title in South Australia. Semi-detached houses come only in pairs, whereas townhouses may number more than two, attached together. 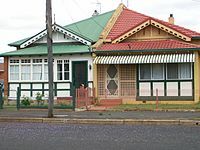 In Sydney, semi-detached houses still referred to as 'semis' were briefly popular at the beginning of the 20th century and many examples may be found in inner suburbs such as Drummoyne. However, this style quickly gave way to the 'modern' style of detached housing which allowed better motor vehicle access, amongst other benefits. The semi-detached house was seen as a good fit for downtown Toronto's narrow lots early in the city's history, and in the late 19th century they were built in areas such as The Annex and Cabbagetown in assorted styles: Gothic Revival, Queen Anne, Second Empire, bay and gable. The building type was arguably most popular during the first few decades of the 20th century. Semi-detached homes continued to be built in the post-war period, often alongside detached types such as the bungalow. They remain popular with developers today because they are cheaper to build than detached houses. According to the 2006 census, Toronto had more than 139,000 semis, more than any other Canadian city by a wide margin. Red-brick semis are a common sight throughout downtown and older suburbs, helping define the character of the city's neighbourhoods. Semi-detached Jugendstil townhouses in Bonn, Germany. "Semi-detached suburban Mr. James", written and performed by Manfred Mann. A satirical song about a lost love marrying a boring man from semi-detached suburbia, released in 1966 (Fontana TF 757), reached No. 2 in the UK charts. ^ Anon. "Special Feature 2: Semi-Detached Properties" (PDF). Nationwide: House prices. Nationwide. Retrieved 12 July 2010. ^ Burnett 1986, p. 34. ^ a b Burnett 1986, p. 35. ^ Smith 1834, p. 27. ^ Lofthouse 2012, Housing the Rural Working Classes. ^ a b Lofthouse 2012, Housing the Urban Working Classes. ^ Burnett 1986, p. 94. ^ Burnett 1986, p. 95. ^ a b c d Lofthouse 2012. ^ a b Burnett 1986, pp. 98-99. ^ "Where, when and by whom were semi-detached houses first built? - Notes and Queries - guardian.co.uk". www.theguardian.com. ^ Wainwright, Oliver (1 April 2015). "The grand London 'semi' that spawned a housing revolution – a history of cities in 50 buildings, day 8". The Guardian. Retrieved 1 April 2015. ^ "BBC - Standard Grade Bitesize History - Public health : Revision, Page 3". ^ Burnett 1986, p. 223. ^ NHBC 2015, p. 5. ^ Park 2017, p. 23. ^ Kyles, Shannon. "Styles Page". ontarioarchitecture.com. ^ "Don't get too attached: A primer on the semi". nationalpost.com. 3 March 2012. Burnett, John (1986). A social history of housing : 1815-1985 (2nd ed.). New York: Methuen. ISBN 978-0416367805. Lofthouse, Pamela (2012). "The Development of English Semi-detached Dwellings During the Nineteenth Century". Papers from the Institute of Archaeology. 22: 83–98. doi:10.5334/pia.404. Park, Julia. "One hundred years of space standards" (PDF). Housing Space Standards. Retrieved 11 February 2017. Turner, Clive (2015). The making of modern housing - NHBC (PDF). Milton Keynes: NHBC Foundation. ISBN 978-0-9930691-3-0. 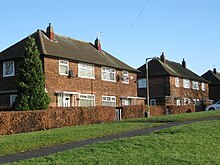 Wikimedia Commons has media related to Semi-detached houses. The Semi-Detached House by Hon. Emily Eden (1797-1869), published London: R. Bentley, 1859.